Although Lancaster County back roads may not be ideal for large vehicles, such as tractor trailers, throughout the year these winding, little-traveled Lancaster roads can be a bicyclist’s dream. Here you can hit the open road and get away from congested traffic and businesses. Most of the back country roads in Lancaster County are open fields and farmlands. Ride at your own pace and listen to the quiet as you ride past Amish farmlands and open fields. Along the way you’re likely to discover many scenic sights and encounter rural Lancaster life first hand. Be on the lookout for one-room schoolhouses, covered bridges, Amish farmers in their fields, and Amish in-home businesses selling anything from quilts and craft items to baked goods and home-made root beer. Bicycling allows you to set your own pace and stop at road-side stands, talk to the animals, and take lots of photographs (please respect the privacy of our Amish neighbors who don’t appreciate having their pictures taken). 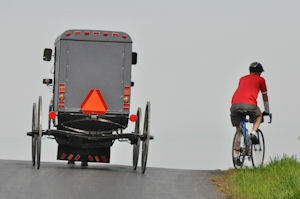 If you’re riding roads that are shared by Amish or Mennonite buggies, mix common sense with caution. You may well be riding faster than they are, so when you pass a buggy make sure the road ahead is clear, and leave plenty of room ahead of the horse before you pull back over into your lane. You don’t want to startle the fella. Also, keep in mind that these buggies often don’t use turn signals when turning onto farm lanes. They may turn suddenly in front of you with no warning. And often the buggies won’t come to a complete stop at stop signs. They may only slow down. Just be alert. Also, be aware that along the way you may encounter road apples (horse droppings) that may have been deposited on the road in front of you. When approaching a covered bridge keep in mind that these are one-lane bridges. Watch for approaching traffic from the other direction. The Lancaster County terrain is generally flat. The more challenging hilly areas lie south of Strasburg and Route 741. Stay off the numbered highways and you may have many of these scenic roadways almost all to yourself. The Lancaster Bike Club lists PDF directions for over 20 scenic Lancaster County tour routes on their website. Don’t want to ride alone? Bike with a buddy via the Lancaster Bike Club. There are weekly group rides all year long posted on their website. Here is an refresher on Pennsylvania Biking Laws and safety precautions.